Scientists from the Polytechnic Institute of New York University have developed a nano-enhanced biosensor that can detect a single cancer marker protein. Brooklyn, New York — Just months after setting a record for detecting the smallest single virus in solution, researchers at the Polytechnic Institute of New York University (NYU-Poly) have announced a new breakthrough: They used a nano-enhanced version of their patented microcavity biosensor to detect a single cancer marker protein, which is one-sixth the size of the smallest virus, and even smaller molecules below the mass of all known markers. This achievement shatters the previous record, setting a new benchmark for the most sensitive limit of detection, and may significantly advance early disease diagnostics. Unlike current technology, which attaches a fluorescent molecule, or label, to the antigen to allow it to be seen, the new process detects the antigen without an interfering label. Stephen Arnold, university professor of applied physics and member of the Othmer-Jacobs Department of Chemical and Biomolecular Engineering, published details of the achievement in Nano Letters, a publication of the American Chemical Society. This latest milestone builds on a technique pioneered by Arnold and collaborators from NYU-Poly and Fordham University. In 2012, the researchers set the first sizing record by treating a novel biosensor with plasmonic gold nano-receptors, enhancing the electric field of the sensor and allowing even the smallest shifts in resonant frequency to be detected. Their plan was to design a medical diagnostic device capable of identifying a single virus particle in a point-of-care setting, without the use of special assay preparations. At the time, the notion of detecting a single protein—phenomenally smaller than a virus—was set forth as the ultimate goal. The implications of single protein detection are significant and may lay the foundation for improved medical therapeutics. Among other advances, Arnold and his colleagues posit that the ability to follow a signal in real time—to actually witness the detection of a single disease marker protein and track its movement—may yield new understanding of how proteins attach to antibodies. Arnold named the novel method of label-free detection “whispering gallery-mode biosensing” because light waves in the system reminded him of the way that voices bounce around the whispering gallery under the dome of St. Paul’s Cathedral in London. A laser sends light through a glass fiber to a detector. When a microsphere is placed against the fiber, certain wavelengths of light detour into the sphere and bounce around inside, creating a dip in the light that the detector receives. 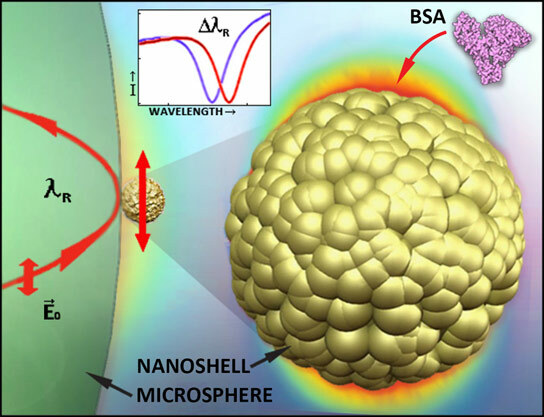 When a molecule like a cancer marker clings to a gold nanoshell attached to the microsphere, the microsphere’s resonant frequency shifts by a measureable amount. The research has been supported by a grant from the National Science Foundation (NSF). This summer, Arnold will begin the next stage of expanding the capacity for these biosensors. The NSF has awarded a new $200,000 grant to him in collaboration with University of Michigan professor Xudong Fan. The grant will support the construction of a multiplexed array of plasmonically enhanced resonators, which should allow a variety of protein to be identified in blood serum within minutes. The publication in Nano Letters marks the 100th journal-paper published since the 1978 founding of NYU-Poly’s Microparticle Photophysics Laboratory for BioPhotonics, directed by Arnold. Be the first to comment on "Nano-Enhanced Biosensor Detects Single Cancer Protein"